Here on Needle ‘n Thread, I like to index each step-by-step project in one place so that it’s easy for you to find it and follow the various articles in the series. You can find my indexed step-by-step projects under Tips and Techniques, at the top of the page, under Hand Embroidery Lessons & Step-by-Step Projects. The purpose of today’s short article, then, is to create an index for the Hungarian Redwork Runner project. Here, I’ll list in chronological order every article that has to do with this project, from development through finishing. You’re welcome to follow along on this project, to stitch along with me, or to save it for later. All the information on it will be here, whenever you need it. What Can You Learn from This Project? Even if you don’t plan to follow along by actually stitching the Hungarian Redwork Runner, I hope you will find the articles useful and informative. I’ll definitely be including tips along the way that you can apply to your own embroidery projects. And of course, mistakes are part of just about every embroidery journey. Mistakes are a great way to learn, so I have no problems at all in showing you my mistakes (I make plenty of ’em!) and working out how to fix them…. or at least, how to minimize their impact! Picking Out Red Embroidery Threads! The Chain Stitch is All Finished! If you have any questions, suggestions, or comments along the way, feel free to leave a comment (here or below any individual article in the series) to have your say! Can’t wait to follow your progress on the Hungarian Redwork project and venture through your instructive techniques. I always learn lots of new techniques with you as I did with medallion project so look forward to this journey. I’ve been stitching for many, many years. Started with the kits that had the design already done in petit point and I stitched the background in the continental stitch. I’ve done painted canvas, designed my own with specialty stitches, now I mostly do counted cross stitch. I am learning something from you everyday and I will tell you how much I am enjoying it. I am thinking about working a table runner into my rotation. When you’re retired like I am, what’s another project? Thanks for doing an index. This will be very helpful when the time comes to try this. Thank you for the index, it will be very helpful. I am anxiously waiting to follow you through the project. You are an inspiration for me. Dear Mary, I have been following your Blog for a couple a weeks and love the everything about it, you put so much love and effort into it for all of us! I have been quilting for years and like to include embroidery but I love this Redwork. I have brought the fabric and waiting for the thread ,which I have just ordered .So very much looking forward to this project,and others to come! Thanks so very much for sharing your love of everything Embroidery! Best Regards, Chris W.
Mary, I am surprised that you did not buy all of your thread at the same time. I thought it was important to get it from the same dye lot. Stanton(Australia) and is so different to what I usually work on and one has to be SO accurate. I’m trying to do this project, Im starting to wonder if I’m going to ever get it done. But wanted to say thank you for all the information. I am so glad that I have found your website. We had a wonderful needle arts shop in the 80’s in our town. The owner was so creative and she introduced us to some beautiful things. We had wonderful projects and we were always working on new designs and learning new techniques. I am glad to see this art being promoted again. I am a lot older now so I do not know how much I will be able to do, but your designs have sparked an interest. I had a problem with my PayPal account this am and after 2 1/2 hours trying to straight it out I was too late to order the strawberry kit. Please tell me it will be offered again. To hoop or not to hoop–that is the question. I am a hooper. Except on beadwork and silk ribbon & the like, I always hoop. However, I just finished a “chicken scratch” project (minus the hooping) and have decided to always hoop in the future. Oh well–I had to try. Thank you for your website and blog. Your comments make me laugh & makes my work go faster. Thanks again. Talk about visiting old projects I’m about to finish this project but couldn’t fine we’re you finish the edging. Could you give me some suggestion on how to finish the runner. Wrote to you about this runner before I’m doing it in forest green. Is there a PDF for the Hungarian redwork runner. Yes, there is – it’s in the index above – there are a couple versions, but if you want the same one I’m using, it’s under the final design article. Mary, this is so BEAUTIFUL!!!! Mary, I don’t comment as often as I should, but I do stop by regularly to drool — seems like daily life keeps me busier than I’d like to be. To look at your work, and especially this runner, a person would take it as machine embroidered — because it’s such perfection. You have the most amazing talent. BEAUTIFUL!!! Hi, Jamie! Thanks so much! I’m glad you enjoy checking in now and then! Awesome, no other words to describe your work. Oh Mary. This is absolutely beautiful. Wow, I can see a lot of work went into it. Just beautiful. I love,love,love red. And, you are a woman after my own heart. I always wondered why the center of doilies or table scarfs were stitched when the center piece would sit right over the stitching and not be seen. This is perfect. It certainly makes me want to stitch a runner. 🙂 Your a star! How did you get the thicker line? The regular ones I got but not the more’fat’ thicker ones. Beautiful piece, I used your video to learn that stitch. Hi, Ruth – the thicker lines are Hungarian braided chain stitch. You can find a tutorial for it here: https://www.needlenthread.com/2012/07/hungarian-braided-chain-stitch-video.html The Hungarian braided chain is worked with #8 pearl cotton. The thinner lines are regular chain stitch, worked with coton a broder #25, which is a finer thread. 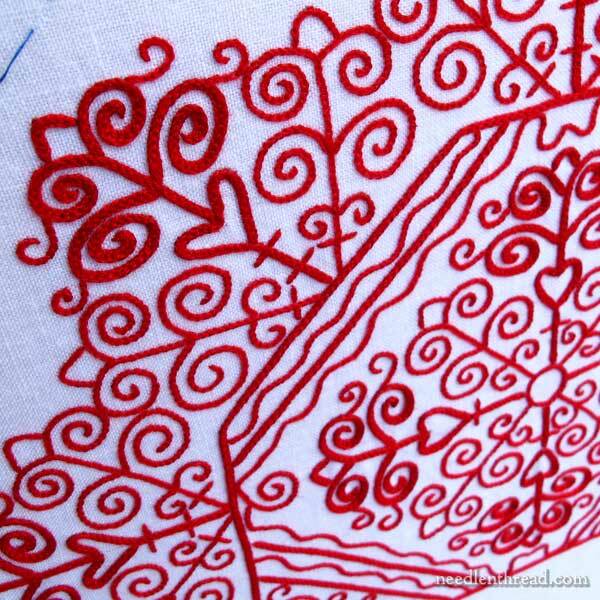 I absolutely love redwork embroidery and your table runner is beautiful. Some day, I hope to be able to create one. Mary, you inspire me every day.